Come Play at Colorado Blvd. 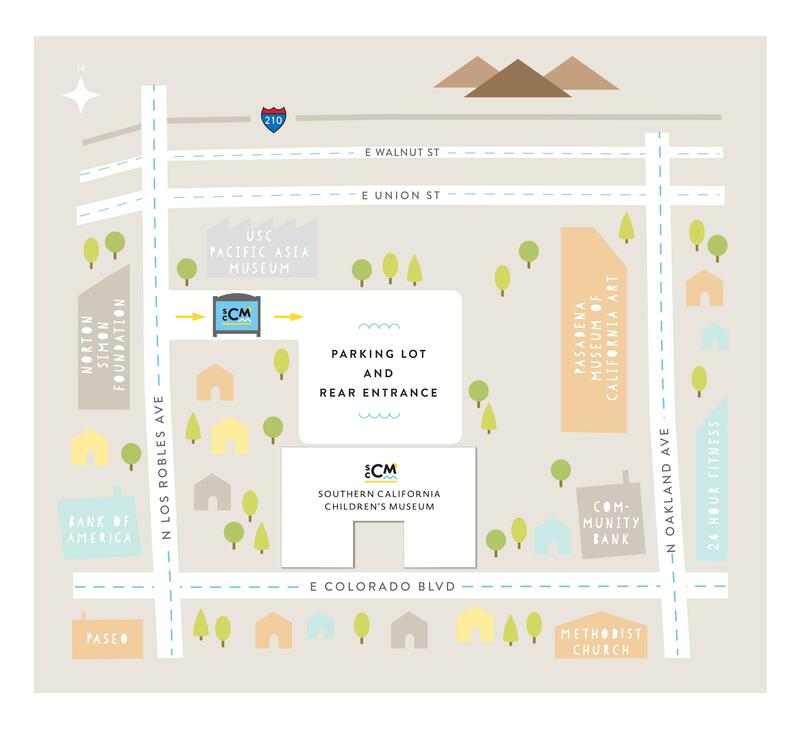 Our FREE parking lot is located behind the museum on Los Robles, between Colorado Blvd and Union. ADMISSION FREE for children under 1. $8 for adults and children 1 and over. 10 Play Pass - 10 individual visits for only $60, a $20 savings! Museums for All Admission: $3. You must present state-issued EBT card along with valid photo ID. "Twosdays" Special: 2-for-1 admission on Tuesdays after 2pm. CLEAN UP Be a good citizen! We know that messes are part of the fun and part of being creative. Cleaning up after you’re finished will help us provide a better experience for everyone, including you! ENGAGE Exploring with your child is a large part of the SCCM experience. We provide a collaborative, engaging experience where adults can encourage and build upon children’s self-initiated play. Engage with your child, you’ll be surprised by what you both learn! EXPLORE Make sure to allow enough time to play with everything in the museum. Take your time exploring each exhibit. FAMILY CARE Diaper-changing stations are in the restrooms. Emergency diaper kits are available. FOOD AND DRINKS We allow food and drinks in our designated snack room. Help us keep SCCM clean by not eating or drinking (water allowed) on the museum floor. INS & OUTS Daily admission allows visitors to come and go throughout the day. There is no time limit to how long visitors may stay and play! (business hours vary) LET’S WORK TOGETHER SCCM is growing everyday! We welcome your feedback and suggestions. NO SMOKING There is no smoking allowed, including e-cigarettes. NURSING ROOM (coming soon!) We offer a relaxing, private room complete with cribs, comfy chairs, and changing tables for your nursing and childcare needs. PETS Only trained service animals are permitted. PLAY TOGETHER, STAY TOGETHER An adult must accompany all children, and a child must accompany all adults. Chaperones are responsible for their safety and the safety of their children. READ AND SHARE Help your child make the most of their SCCM time by reading any signage around the museum and then sharing this information with them. SANITIZE If your child puts any object or toy in their mouth, place the object in one of our sanitation bins to be cleaned. SHOES We require shoes to be worn in the Museum for the safety of our visitors. SHOPPING & SNACKS That’s Darling is an onsite children's boutique for all your adorable needs. They have the most darling of things for the unique and modern family. In addition, SCCM sells select snacks and cold beverages. SPEAK UP Our team is here to ensure your experience SCCM in a safe, meaningful, and fun way. Talk to a member of our team if you have any questions, issues or concerns, or to report an injury or emergency situation. STROLLERS & STUFF We have a stroller parking area and cubbies available for your bags and belongings. THEFT We cannot be responsible for left or lost at the museum. Leave valuables at home or in your vehicle. WALK DON’T RUN SCCM has a variety of levels with steps and ramps. Stay safe and walk, not run. The Southern California Children's Museum is the perfect space for your next celebration. With costumes, toys, and access to all of our wonderful exhibits, it will definitely be a party to remember! For all the details, give us a call at 626.657.0357 and make planning your child’s celebration a piece of cake! 30 people included in the minimum fee. Maximum capacity is 40 people during business hours with a maximum of 24 children. We have private party options too! All-day museum play until close, plus use of our private party space for 2 hours (plus 20 minutes for set-up). Party tables with seating - you provide all food, drinks, paper goods, etc. Staff to oversee the needs of party guests and assist with set-up & clean-up. Please call for available birthday party times!